Our test results for the new MacBooks made this point, but it bears repeating as we turn our attention to the revamped MacBook Pro models released by Apple a week ago: the performance gap between the consumer and professional offerings in Apple’s laptop line is narrowing. With just three points separating the Speedmark scores turned in by the entry-level 2.4GHz MacBook Pro and the high-end 2.4GHz MacBook model, the choice between Apple laptops is no longer based on performance versus portability. Rather, the MacBook-vs.-MacBook Pro decision leans more toward features and expandability versus size and weight. Which is not to say that the improvements Apple introduced to the MacBook Pro don’t lead to performance gains just as notable as what we saw with the new MacBooks—in fact, the new 2.53GHz MacBook Pro is the fastest standard configuration Mac portable we’ve tested. Here’s a recap of what changed with the MacBook Pro. The new lineup features a unibody chassis and Intel Core 2 Duo processors running at either 2.4GHz (in a $1,999 configuration that comes with a 250GB hard drive and 2GB of RAM) or 2.53 GHz (in a $2,499 system with a 320GB hard drive and 4GB of RAM). There’s also a 17-inch 2.5GHz MacBook Pro with a 320GB hard drive, though it comes in the old enclosure. The 15-inch MacBook Pro models have a new unibody design. Best results in bold. Reference systems in italics. With a Speedmark 5 score of 231, the new top of the line MacBook Pro was 7.5 percent faster than the 2.4GHz entry level MacBook Pro. The 2.53GHz model was 16 percent faster in completing our Photoshop test suite than the new 2.4GHz Pro model. Comparing the new high-end MacBook Pro to the last generation’s best standard configuration—a 2.4GHz MacBook Pro with 2GB RAM—we see the newer model with a 16 percent higher Speedmark score and 26 percent faster Photoshop times. (Note that we ran all our tests using highest performance settings, meaning the new MacBook Pro models used the GeForce 9600M GT graphics.) The new entry level 2.4GHz MacBook Pro was 8 percent faster than the older top-of-the-line model in Speedmark, and 12 percent faster at Photoshop. 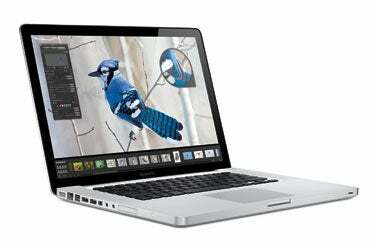 We also compared the new models to a 2GHz MacBook Pro introduced in February of 2006. Looking at that older model versus the new low-end MacBook, we see a 48 percent improvement in Speedmark scores, a 32 percent improvement in Photoshop, and Quake frame rates almost two-and-a-half times as fast in the new system. We’ve also completed battery life testing for the new laptops introduced last week; we’ll post that information soon. And we’re waiting for the November release of the revamped MacBook Air offerings to test those ultra-portable machines. Updated at 2:44 p.m. PT to correctly identify the Core Duo processor in the February 2006 MacBook Pro.